As we write this article, our inspiration is enhanced with the rich aromas from our pot of chocolate, personally harvested and hand processed, currently simmering on our stove. For over half a century we knew very little about chocolate other than enjoying the taste of the final product - most often milk chocolate candy. We are not going to be talking about common milk chocolate candy. Real high quality chocolate with a cocoa content higher than 80% contains very little sugar, and is an anti-oxidant-rich health food, complementing a glass of fine red wine. Appendix I lists 13 health reasons we should consume more dark chocolate. Raw chocolate is subjected to minimal heat during processing. Having now personally grown two trees, harvested the cocoa cob from the trees, undertaken the many processing steps to reach chocolate we have a new recognition & incredible appreciation for the amount of work involved. Cacao trees are grown within a tropical belt 10 degrees of the equator. This cacao plantation is interplanted with banana trees. The cacao tree is the shorter tree above, averaging between ten and thirty feet on a plantation and twice that tall growing wild in the amazon rainforest. Immature cacao pods have a variety of colors but most often are green, red, or purple. Each tree will produce 30 to 40 pods per year. They take six months to mature and their color changes towards yellow or orange when ready for harvesting. A typical pod contains 20 to 50 beans and it takes about 400 beans to make one pound of chocolate. Opening the pod we remove the beans which are covered in a white fleshy pulp which has a delicious, delicate fruity flavour. You can clean the beans of this white sticky substance in your mouth, or leave it to ferment with the bean. Commercially the beans are left in large heaps to ferment for a week or two. They must then be dried in the sun for another 5 to 15 days. When traveling the coastal regions you will often see beans drying along the roadside or on cement patios nearby. Once dried the cacao beans are now ready for roasting. This can be done by either placing them on an oven tray at a temperature of about 180 degrees Celsius for 30 to 45 minutes until they start to crack, or in a pot stirring constantly over a flame. We have used both methods and found the flame's more intense heat cracked the beans better making the winnowing process easier. You must be careful not to burn the beans. After roasting, the husks must be removed from the outside leaving the nib, this is called winnowing. This is a very manual and time consuming process. We now take the nibs and grind them into a liquid or chocolate liquor. The smooth, bitter-tasting paste extracted from the beans is the key ingredient in making chocolate. The chocolate liquor is blended with cocoa butter, and other ingredients, simmered and stirred for several hours. The resulting mixture is tempered then poured into a molding tray and cooled to harden and form a bar of highly pure chocolate. 100 % chocolate is still bitter and contains no sugar. The lower the % of chocolate the more sugar has been used. Your slabs of pure chocolate are now ready to transform into a hot chocolate drink, adding fruit or nuts, and flavours for making traditional chocolates, making a tropical fruit fondue, using in baking brownies etc, or simply enjoyed with a glass of red wine. Appendix II includes several recipes for your enjoyment. 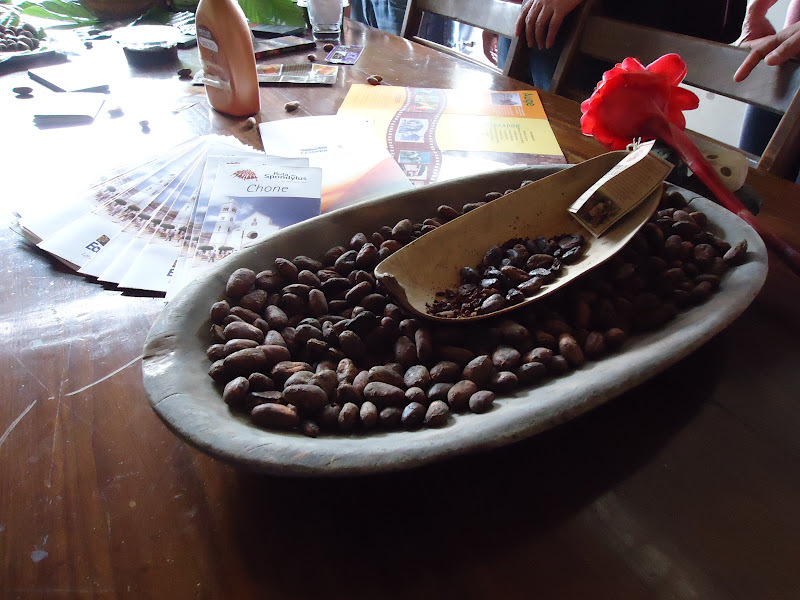 Chocolate tasters say the aroma of Ecuador's cacao is more complex because Arriba beans vary hugely in taste and size according to the area in which they are grown. Ecuadorean chocolate is known for its floral characteristics, some beans taste more like fruits, while others have a nutty flavour. Much like wine, chocolate reflects the flavour notes of the region where the cocoa beans are grown, and how they are dried and fermented. Sarah Jane Evans, a leading UK food author and founding member of the Academy of Chocolate, in her book Chocolate Unwrapped, says that the characteristic of Ecuador's fine cocoa is "a floral profile with blackcurrants and spice." Santiago Peralta, founder of Pacari in 2002, a successful Ecuadorean brand of fine organic chocolate. says "each bean has a special, different flavour." Mr Peralta says the quality of Ecuador's chocolate is due to the country's diversity in terrain and equatorial location on the equator. By starting at the farming sources of the treasured fine flavour cacao, and controlling the entire process we attain the best flavour and texture possible made entirely in Ecuador. Africa supplies over 70 % of the world's cacao production. In 2012 Ecuador produced 133,000 tons of cacao - however that only represents 2.7 % of the world's annual supply. Currently Ecuador has over 400,000 hectares of cacao under cultivation. Over the last decade international recognition and demand for more flavourful cocoa has increased. Ecuador is emerging as a pre-eminent exporter of fine beans. The most famous native cocoa beans are "Nacional" or "Arriba". In the lush province of Esmeraldas ( one of the poorest provinces in the country ), on Ecuador's northern border with Colombia, farmers proudly say they produce "black gold". 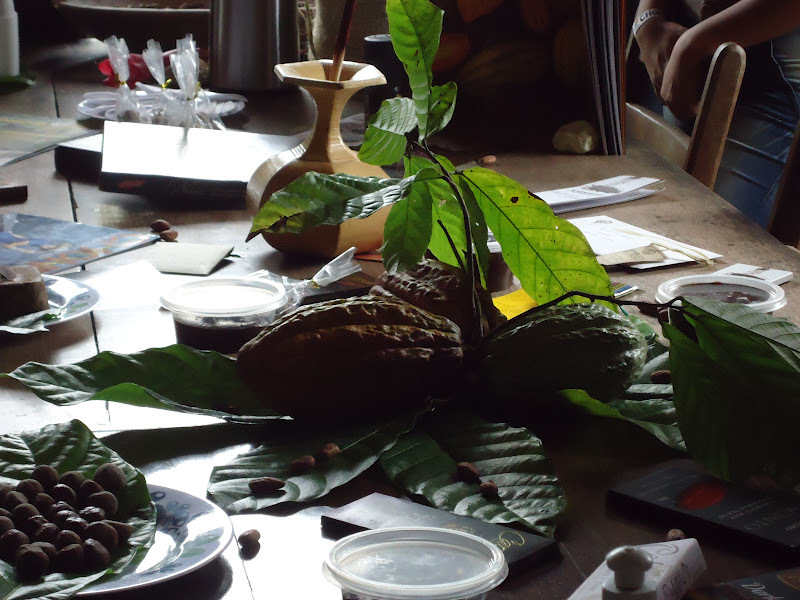 They are not talking about oil, Ecuador's main export, but cacao beans for making exquisite quality chocolate. 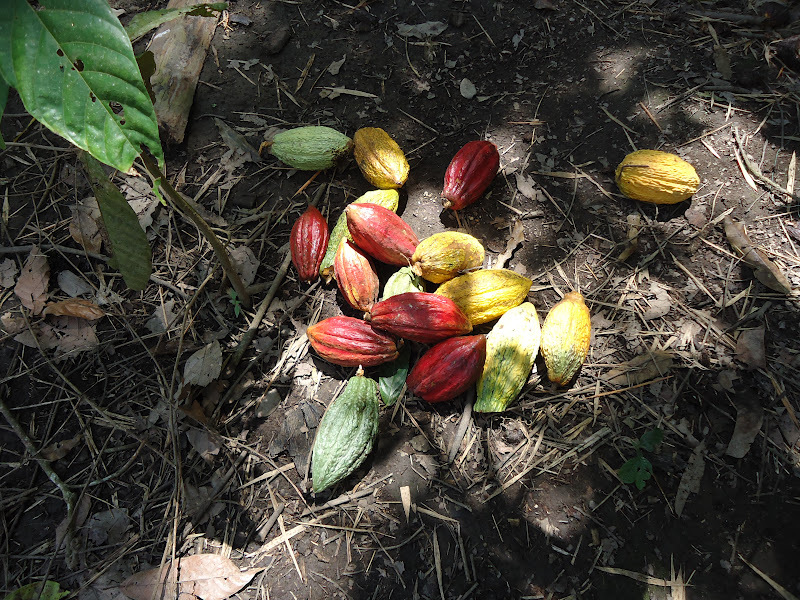 High quality cacao production has become a sustainable source of income for Ecuador's farmers. The smaller farms of today have mango, papaya, plantain and citrus trees scattered among the cocoa plantation, creating a huge influence in the cacao bean's flavor. Currently the artisan chocolate business is booming in Ecuador where distinguished culinary flavors are recognized by region, and even the individual farm. Cocoa beans are one of this Andean country's claims to fame, being the world's largest exporter into the early 1900's. Scholars & Archaeologists believe cocoa plants originated in the Amazon basin. Discovery's have shown that in Ecuador's southern Amazonian region of Zamora Chinchipe cocoa beans were being harvested and consumed more than 5,000 years ago. The West's love affair with chocolate started much later - in the 16th Century, when Aztec ruler Montezuma introduced Spanish conquistador Hernan Cortes to a spicy chocolate drink, known as "xocolatl". The addition of sugar to the mix created popularity in Europe and Ecuador was exploited for its cocoa. By the mid-1800s, cacao comprised over half of the exports of Ecuador. Plant disease created disaster in 1916 & 1919 with production plummeting to less than 10 %, and the rise of new cultivations in British and French colonies across Africa and Asia caused Ecuador to loose its top spot. Hybrid species more resistant to disease, artificial shade, irrigation, and fertilizers were introduced. Farmers replaced cacao with crops of bananas and coffee which were then more lucrative. Besides the risks and worry over diseases and insects, cacao farmers must contend with monkeys, squirrels and birds that enjoy the sweet pulp of the cacao and discard the "nasty-tasting" seeds. This is not all bad as if the creatures do not injure the beans, and they fall unscathed on fertile ground it will result in a new cacao tree. Visitors who travel to Ecuador will see Theobroma cacao trees growing on farms and plantations from the coast towards the Andes, from Guayas Province north to Esmeraldas Province, and on Ecuador Amazon tours, growing wild along river banks. Normally visitors arrive in Ecuador in either Quito or Guayaquil. 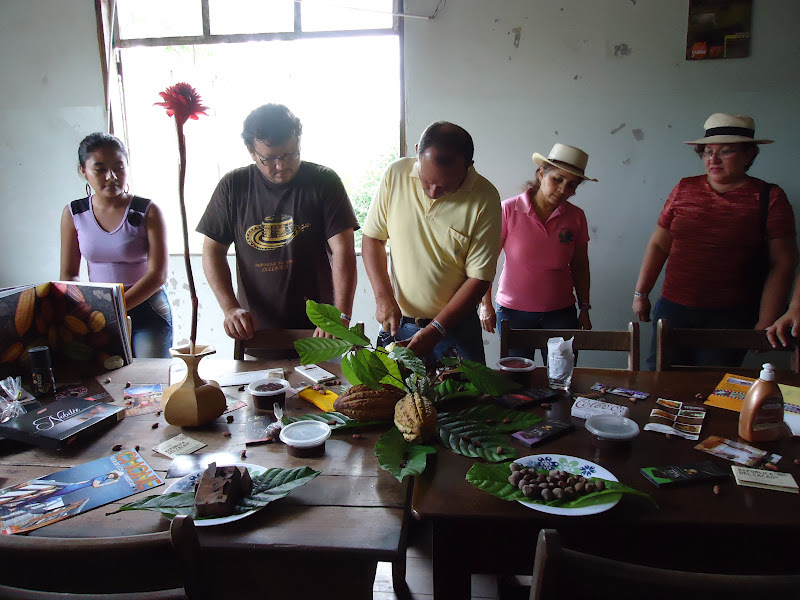 Take the opportunity to interact with local artisans who craft a variety of delicious products from the fresh chocolate. In central Manabi visit the hacienda house and cacao plantation fields of La Providencia, approximately 20 kilometers East of Chone. If time permits a more intriguing option is spending a week immersed at the Río Muchacho Organic Farm ( near Canoa ) in the cacao plantation. 2. Chocolate may reduce the risk of heart failure. 5. Chocolate helps support the production of dopamine in the body. Dopamine is a brain chemical that helps us feel good. Impaired dopamine production is involved in brain disorders like Parkinson's disease. Foods that aid the production of dopamine may be helpful in the prevention of such illnesses. 6. Cocoa, or chocolate with high amounts of it, lowers LDL cholesterol and raises HDL cholesterol (the good cholesterol). 8. Eating chocolate increases the levels of endorphins the body's own natural pain killers. Eating dark chocolate may help reduce pain. 9. Raw cacao increases the amount of a substance called N-arachidonoylethanolamine in the brain It is a neurotransmitter that improves communication between brain and nerve cells.It may also improve human memory. 13. It just tastes great. That's enough reason for most people. Chocolate truffles are generally deemed sinful thanks to the preponderance of cream and butter that is part of their charm. But it doesn't have to be that way! This version relies on raw cashews and dates for a rich and healthy base that is packed with nutrients rather than high-calorie dairy. Yum! 1. Melt chocolate in double boiler until just melted. 2. Meanwhile, blend 2/3 cups cashews with 2/3 cups water in blender on high for 30 seconds. Chop remaining cashews and set aside. 3. Fold together melted chocolate, cashew mixture, dates, sea salt, and orange zest. We stumbled upon this brownie recipe in The Vegan Family Cookbook by Brian P. McCarthy (Lantern Books, 2006) that wowed us. Not only does it negate the need for animal-based ingredients, but it gives the option of including whole wheat flour hurray! The only caveat for us here is that is calls for granulated sugar. We're not big advocates of refined sugar, and recommend replacing the sugar with a natural sweetener. Sucanat works perfectly with chocolate recipes like this because it gives baked goods a rich flavor. 2. In large bowl, whisk together flour, cocoa powder, sugar (or Sucanat), baking powder, salt, walnuts and chocolate chips. 3. In a blender, blend the soy milk, oil, tofu and vanilla. 4. Add blended mixture to the flour mixture in the large bowl and stir until just combined. Batter will be thick. 5. Spread batter out evenly into an 8-inch square, oiled baking dish. 6. Bake for 35 minutes or until toothpick inserted in the middle comes out clean. 1. Preheat oven to 350 F. Place dry ingredients in a large mixing bowl and mix well. Combine wet ingredients in another large bowl. Add wet to dry and mix well. Refrigerate for 15 minutes. 2. Place 8 scoops on a well oiled baking sheet and flatten slightly with hand. Space evenly so cookies have room to spread. Our non-profit organization is seeking the rights to use one of your photos for an interactive guide on the links between food systems and climate change designed for middle and high school teachers and students. 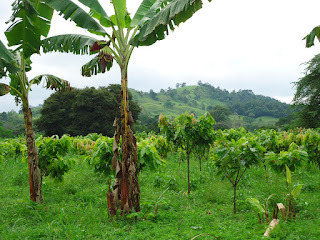 We would like to use the image you've included in this post of the cacao plants interplanted with banana trees. The guide will be available for free - there will be no income generated from it - and will be disseminated widely for educators and the general public. Our organization has over 20 years of experience with publications and will provide credit for the photo based on your specifications. You can visit our website to learn more about us: www.ecoliteracy.org. I would be happy to answer any questions you may have or provide additional information about the project or our organization. Thank you, in advance, for considering this request!